The inventor and designer George Hunzinger secured twenty-one furniture patents between 1860 and 1898, more than any other American manufacturer, for a wide array of folding chairs, tables, chaises, and novel structural innovations. 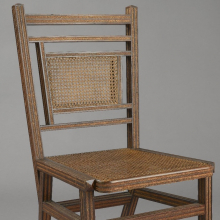 He was both a prescient genius of abstract, spare design and a man of his times: the Japanese tatami matting on this chair illustrates the contemporary taste for exoticism. 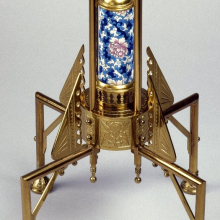 This design was first made by James Dixon & Sons, in Sheffield, England, in the early 1880s. 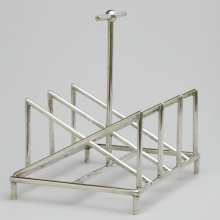 Dresser did freelance work for Tiffany & Company as a purchasing agent in Japan and as a metalware designer; this is the only known version of this toast rack with a Tiffany hallmark. 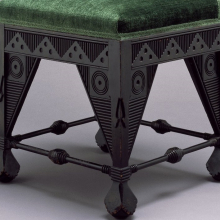 Christopher Dresser, one of the foremost independent industrial designers of the nineteenth century, produced an amazing array of forward-looking designs in ceramic, metal, textile, wallpapers, carpets, and furniture as a freelancer for leading firms such as Wedgwood and Minton. He was trained as a botanist and searched for the underlying geometry in nature. He also hoped to realize the promise of the Industrial Revolution to make well-designed products available to as large an audience as possible, often using inexpensive materials. Thomas E. Warren’s “Centripetal Spring” chair is the forerunner of Don Chadwick and Bill Stumpf’s Aeron chair, designed nearly 150 years later. Both are made principally of metal, raised on casters for mobility, rotate on a central column, and allow for adjustment of the angle of the seat. 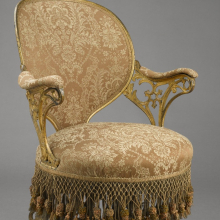 Although Warren’s chair bears a patent mark (on the bottom of the seat), he felt the need to mitigate the newness of his invention by concealing its ingenious metal spring system beneath a dense, soft curtain of luxurious passementerie (elaborate trim). Similarly, he disguised his progressive use of cast iron for the frame by rendering it in the backward-looking Rococo Revival style and gilding it. 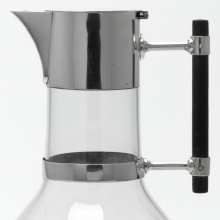 This is a very early example of the use of bent tubular metal to make furniture, a technique more often associated with twentieth-century modernist design (particularly Marcel Breuer’s tubular steel furniture, produced by Thonet in the mid-1920s). Bradley & Hubbard were also pioneers of a progressive manufacturing technique known as the interchangeability of parts. Some of the decorative elements on this table were also used in their brass lighting devices. Casting a large number of the same parts at once and incorporating them into many different designs saved time and money and streamlined production. This innovative, wholly modern process foretold the manufacturing methods of the twentieth century. Featuring more than forty items from our collection of American and European decorative arts, 19th-Century Modern focuses on the emergence of modernism, a design aesthetic based in part on the machine as a source of artistic inspiration. To many, “modern design” suggests the simple lines, abstract decoration, and machine-based methods and materials that gained widespread popularity in the twentieth century. The objects in this installation demonstrate that the development of modern industrial design and the emergence of a taste for abstraction began much earlier. In addition to differences in objects’ appearance, this period marked important modifications in how objects were produced and marketed. The works included illustrate the development of the modern industrial world and of an appreciation for simple decoration based either on geometry or organic curves. The installation features objects dating from the early nineteenth century, when the trend toward modernism began, to the twentieth century. 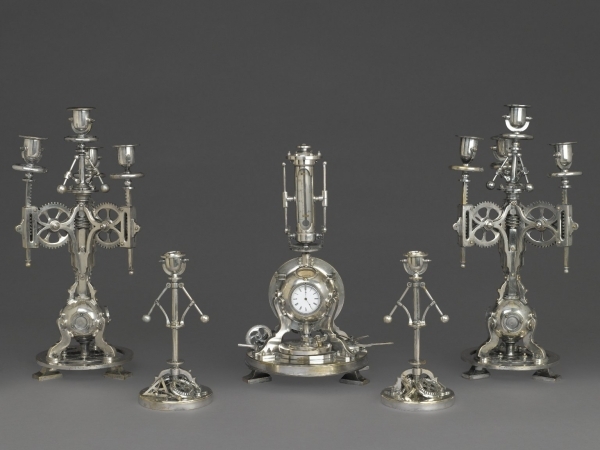 The items on view include furniture by John Henry Belter, Duncan Phyfe, the Thonet Brothers, Samuel Gragg, Bradley & Hubbard, and George Hunzinger; silver objects by Tiffany & Company, Gorham Manufacturing, and Napier (in particular designs by Christopher Dresser and Elsa Tannhardt); and a five-piece French clock garniture manufactured by Guilmet. 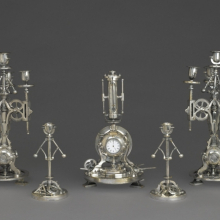 19th-Century Modern is organized by Barry R. Harwood, Curator of Decorative Arts, Brooklyn Museum. Generous support for this exhibition was provided by the Barrie A. and Deedee Wigmore Foundation and the Harold S. Keller Fund.